In 2015, almost 2000 train accidents were reported in the US, and more than 1600 in Europe. Despite the increasing safety of trains circulation, these accidents remain complex to handle as they require emergency teams to intervene quickly, evaluate the risks, and secure the area as much as possible. Depending on the nature of the accident large dispositive such as helicopters are needed to obtain a full view of the scene and a proper evaluation of the risks and damages. The main problems in such situations are the extremely limited access of helicopters to certain areas and the tremendous material and human costs involved, not mentioning the risks taken particularly when no clear view of the environment is available. UAVs, a Revolution for the Railways Industry in the Management of Emergency Situations. UAVs use in such events is incomparably safer, quicker to deploy, cheaper, and extremely efficient as they can provide detailed and real-time images of the entire scene, allowing teams to optimize the risk and damages evaluation and adapt their interventions. 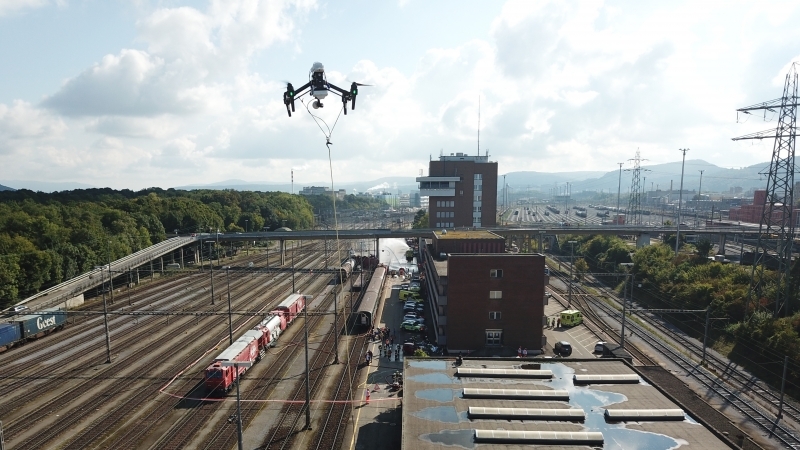 This is what Elistair demonstrated last month when deploying an Inspire drone, continuously powered thanks to its drone tether system Ligh-T, during a chemical accident simulation on SBB’s railways in Switzerland, in real operating conditions. SBB train accident simulation recorded in live with Elistair Ligh-T, a smart drone tether system compatible with DJI drones. 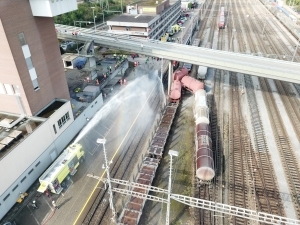 In September 2017, SBB, the Swiss federal railways gathered 350 emergency workers and volunteer citizens to simulate a chemical accident in a train. While the victims were evacuated, decontaminated, and the fire extinguished, Elistair team deployed its Ligh-T, an industrial drone tether system along with a DJI Inspire drone to display continuously and safely a 2h+ real-time video feed of the full scenario. Thanks to its unlimited flight capacity provided by the drone tether system Ligh-T, and thanks to its flexible deployment, the drone was deployed at 50 meters high in less than a minute and offered a stable and full coverage of the whole scene. Besides, the micro-tether provided a safe control of the drone in a complex environment with buildings, high tension wires, running trains, fire, and hundreds of people. A highly flexible system offering a real time, safe and global view of the environment for an optimized risk management and decision-making process in emergency contexts where lives can be at stake. Tethered UAVs: performance, safety and flexibility. • Disaster recovery: emergency network coverage, observation of the damages caused and accessibility. • Military operations: force protection, border surveillance, communication extensions. • Industrial surveillance: persistent surveillance of inaccessible areas, material inspection. • Private or public security: crowd control, traffic monitoring, Assets protection.